I know that I have posted about some of my medical issues before but today is the day that I am choosing to tell you about some very rare things that I deal with. I’m not asking for sympathy, I’m asking you to take a look and educate yourself about some of the things that you may never have heard of. I'm asking that you take a look at these so that others might not have to suffer from the emotional pain that comes with these disorders. I’m also asking you to take a look so that you might be able to better understand me and why I am sick all of the time. I don’t see these things as unfair and I don’t feel jilted by life, but I do feel misunderstood and taken advantage of and blamed at times for my conditions. If you have known me since childhood or young adulthood, then you know that I have been overweight my entire life. If I was going to be skinny by now, I would have been so it’s just not going to happen for me. I can lose small amounts of weight at times, but no matter how hard I try it is just not physically, or at this point medically possible for me to lose weight because of a condition that I was born with. So, to start with my list of rare conditions let me start with what I think is a blessing as far as my self-esteem goes. I didn’t know until just a few years ago that my weight was a problem that I can’t do much about and that I was born with the problem because of EDS. If I would have known this information when I was a child I believe I would have confidence to go out in public without worrying what others are thinking of me because of my weight. When I do remember that this weight isn’t all my fault, then I can remind myself that I’m not all of the ugly things that were said to me that caused me to believe that I’m a bad person because I grew up being overweight. Speaking of rare things, It is a rare day that I can remember that all the names that I’ve been called and all the lectures that I’ve been given in life and all the doctors who have told me that I’m just lazy concerning me being overweight is not what I am. I feel this way because I’ve been belittled my whole life for it by all but maybe a very small handful of people who saw me rather than my weight and you know who you are and Thank you from the bottom of my heart. It was and is cruel for this to still be going on in my life. It is bullying and still to this day is why I believe that friends and family don’t understand why I need so much help with the house and taking care of my mom and why I can’t just jump up and do the things that I used to do. There are reasons beyond what even I have seen until just the past few years. While I’m being honest, I don’t go to events where I will know people there that I could go to with my wheelchair because I know that people think that my weight is the problem as to why I can’t stand up for long or walk very far. Not attending church is a good example. Before I got my chair I wasn't able to attend because it was so tiring. I still get tired using my chair but it's not nearly as severe since my chair saves my energy a bit. Having a rare disorder is life changing but having as many as I have the hardest part of being alive for me is because of my weight and how much I have to watch that I don’t get even larger and how much I fight depression and often suicidal thoughts because of how I have been treated by society because I’m overweight. If you struggle with your weight, then you know exactly what I mean by this. Each day I am dizzy, have a headache, body pain throughout, several joint dislocations or subluxations, muscle cramps and burning muscles, confusion, irritability, chronic fatigue, insomnia, and heart palpitations and I feel like I have the flu on the worst day of the flu and most of all discouragement just to name a few. I wake up with these feelings and it goes downhill from there. So, here is a list of some of the rare conditions I have and a brief explanation of them. Hypothalamic obesity is a rare disorder that I was born with because of EDS. It is caused by damage to the hypothalamic gland. This happened to me because I was born with a form of Intracranial hypertension -External Communicating Intracranial Pressure/Hydrocephalus. When this happens, the hypothalamic gland can be damaged and these patients gain weight even in response to caloric restriction and attempts at lifestyle modification are useless to prevent or treat the obesity. Therefore, I have dealt with being overweight and staying overweight my entire life. Although I have been and am overweight, weight has not been the cause of my physical problems. People that are very thin, middle-sized and heavy have the same problems who have EDS. Weight is not an issue in my disorders other than making them more difficult to deal with. Losing weight, if I could, would not fix or make any of my pain or disorders go away. Elhers-Danlos Syndrome Classical type is a genetic connective tissue disorder that is caused by defects in a protein called collagen. Collagen is like the glue that holds your body together. We are made of 80% collagen so that means that it is in every single part of your body. 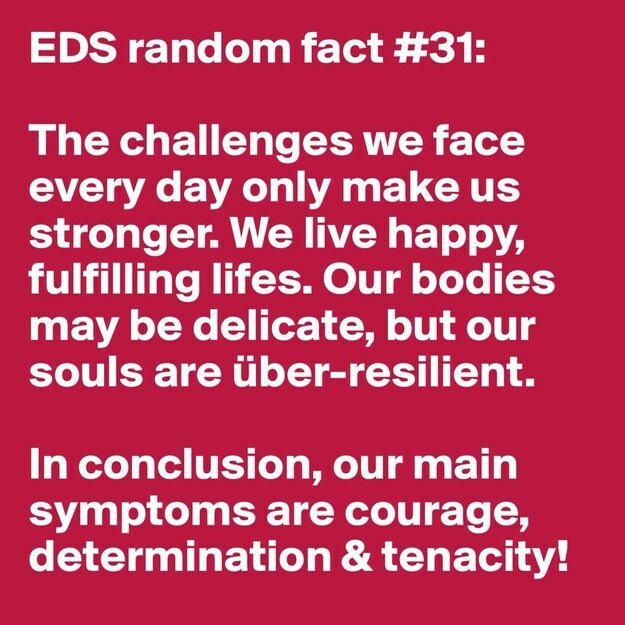 EDS is different in each person and because there are so many symptoms that match other illnesses EDS is often left undiagnosed until patients are in their 30’s or 40’s. There are about 13 different types of EDS and most people, for sure myself, have cross overs from one type to another or more. There is no cure for EDS and there are no medicines for it other than an attempt at lessening the chronic pain. Patients with EDS have chronic pain 24/7. There are times that I have to wear splints to keep from hurting so badly because of dislocation or subluxations, but the pain is always there. This is a progressive disorder and I already have to use a wheelchair at certain times and I’m very afraid that I’m going to be using it full time within the next year or so. Osteogenesis Imperfecta Type 1 is a condition in which bones easily break due to an abnormality in the collagen required for bone strength. Osteogenesis imperfecta (OI) or Brittle Bone Disease is a complicated, variable and rare disorder. Its major feature is a fragile skeleton, but many other body systems are also affected. Loose joints, ligament laxity, and muscle weakness are common. Skin, blood vessels, and internal organs may be fragile. People with Type I OI, the type that I have, the mildest and most common form, may have only a handful of fractures or as many as several dozen fractures in a lifetime. They may have few obvious signs of the disorder. There usually is little or no bone deformity. Height is less affected than in other types of OI. People with Type I OI are often similar in height to other family members. Muscle weakness, joint laxity, and flat feet are common. Dislocations and sprains may occur as well as fractures. Life expectancy appears to be average. Platypnea-orthodeoxia This is caused, for me, because of a hole that I have in my heart that I was born with. The hole opens and closes depending on the position my body is in. I have been told by my heart doctor that less than 30 people in the world have this disorder. I would call that pretty rate. The symptoms occur when the patient is upright, sitting up or standing, and go away quickly when the patient lays down. I will share more about this syndrome in another post. Chari Malformation Type 0 - Chiari (pronounced key-AR-ee) malformation is a condition in which the lower part of the brain, called the cerebellum, herniates through the skull and down into the spinal canal. The herniated tissue compresses the brainstem and blocks the normal flow of cerebrospinal fluid (CSF). The blockage can then cause a buildup of fluid in the spinal cord (syringomyelia) or in the brain (hydrocephalus). Chiari is often misdiagnosed because of the wide variety of bony and soft tissue abnormalities that compress the cervical spinal cord, brainstem, or cranial nerves, resulting in a wide array of possible symptoms. Symptoms include headache, neck pain, dizziness, arm numbness or weakness, sleep problems, fatigue, etc. Headache in the back of the head that worsens with coughing, sneezing, or straining is a hallmark symptom. Dysautonomia, Dysautonomia refers to a disorder of autonomic nervous system (ANS) function that generally involves failure of the sympathetic or parasympathetic components of the ANS, but dysautonomia involving excessive or overactive ANS actions also can occur. Primary dysautonomia is usually inherited or due to a degenerative disease, while secondary dysautonomias result from another condition or injury. The most common types are neurocardiogenic syncope, which leads to fainting. These can occur in a range of combinations, making dysautonomia a difficult condition to diagnose. Mast Cell Activation Syndrome (MCAS) Mast cells are allergy cells responsible for immediate allergic reactions. They cause allergic symptoms by releasing products called “mediators” stored inside them or made by them. ... Sometimes mast cells become defective and release mediators because of abnormal internal signals. This is not the same as having hay fever or being allergic to grass. Anything at any time can cause an allergic reaction, even if it has never caused one for you before. Also, stress, pain, depression, and fatigue can cause a MCAS that takes days to weeks to clear up. • Heart-related symptoms: rapid pulse (tachycardia), low blood pressure (hypotension) and passing out (syncope). • Skin-related symptoms: itching (pruritus), hives (urticaria), swelling (angioedema) and skin turning red (flushing). I always say since I am a single gal, "Boy you would think that with all these rare conditions some guy would want a rare jewel like me but the problem is that I'm like an old rare rock." This is from an open letter that I found online some years ago. I have written it to fit my situation. Feel free if you would like to have a letter to share to use this one or use it as a guide to writing your own. I am sharing this letter with you because I need your support and understanding about something that makes life very difficult for me. Many of my friends have known for a long time that something is wrong with me but they didn’t know what and even I didn’t know what it was for a long time. This is part of what is wrong with me. I have a genetic disorder called Ehlers Danlos Syndrome Classical Type 1 or sometimes just known as Classical Type. The type I have effects about 1 in 20,000 to 50,000 people although there are many others out there like I was who have gone undiagnosed. 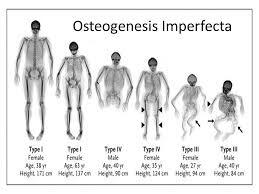 I have another rare genetic disorder called Osteogenesis Imperfecta Type 1. In my younger days, although I had pain, I could do lots of things with my body that I can no longer do. You know the people in Cirque Soleil and the stretchy man at the circus? Well, they are able to bend their bodies because they have EDS that is why they can do what they do. 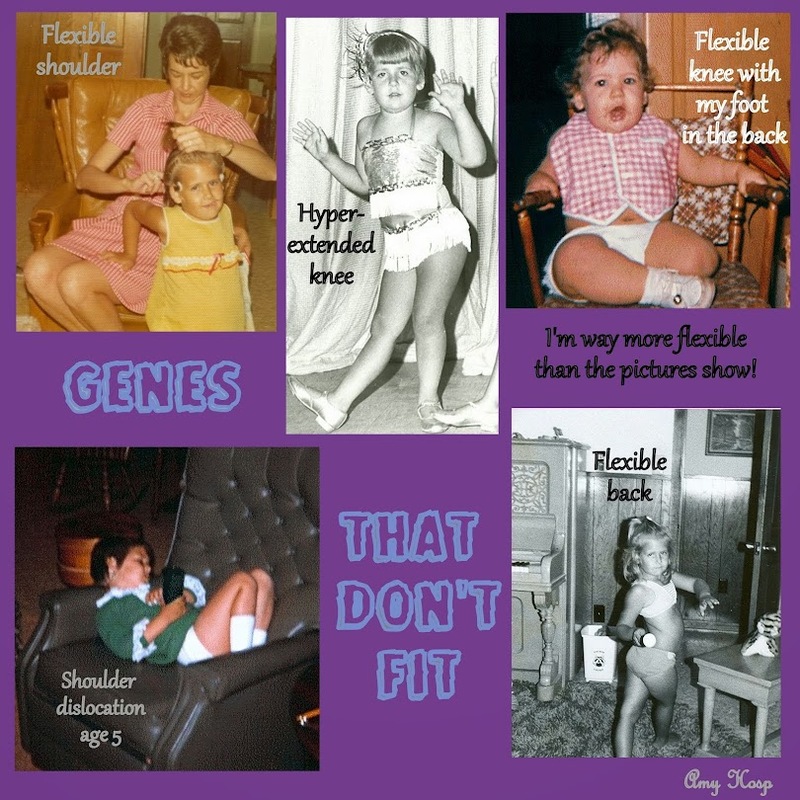 It is good to know what is wrong with me as Ehlers Danlos Syndrome and Osteogenesis Imperfecta OI explains everything that has ever been wrong with me from literally the top of my head to the bottom of my feet since birth. I am however dealing with the reality that my pain and fatigue along with many other things that I deal with will be with me for the rest of my life. My pain greets me in the morning, stays with me in every step I take and every movement that I make, it puts me to bed at night, or earlier, and it haunts my dreams and wakes me from my dreams nightly. This as for now will be the rest of my life. 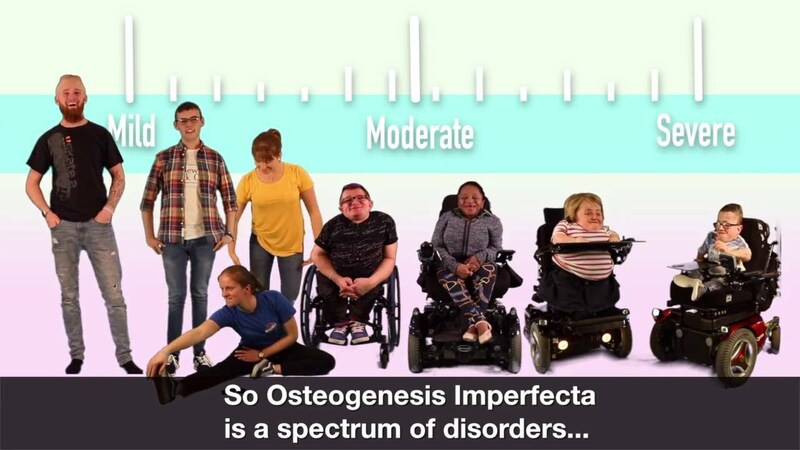 Osteogenesis imperfecta (OI) or Brittle Bone Disease is a complicated, variable and rare disorder. Its major feature is a fragile skeleton, but many other body systems are also affected. OI is caused by a mutation (change) in a gene that affects bone formation, bone strength and the structure of other tissues. It is a life-long disorder. OI occurs equally among males and females and in all racial groups. It is estimated that approximately 25,000 to 50,000 people in the U.S. have OI. Having OI and EDS Classical type together is extremely rare, it is said that there are less than 30 people in the world with this combination. With good medical management and supportive care, the majority of people who have OI can expect an average life span. OI exhibits wide variation in appearance and severity. Severity is described as mild, moderate, or severe. The most severe forms lead to early death. Clinical features (observable signs) such as fracture frequency, muscle strength or extraskeletal problems vary widely not only between types, but within types, and even within the same family. Some features are age-dependent. People with Type I OI, the mildest and most common form, may have only a handful of fractures or as many as several dozen fractures in a lifetime. They may have few obvious signs of the disorder. There usually is little or no bone deformity. Height is less affected than in other types of OI. People with Type I OI are often similar in height to other family members. Muscle weakness, joint laxity, and flat feet are common. Dislocations and sprains may occur as well as fractures. Life expectancy appears to be average. Most people with Ehlers Danlos Syndrome live a normal life span but there are parts of this syndrome that can affect your heart and veins that can lead to an early death. There are about 9-13 types of Ehlers Danlos and the type I have is one that should allow me to live a normal life span although I may have some cross over to a type of EDS called Vascular which can cause sudden rupture of organs and arteries. Having OI also puts me at risk for this. 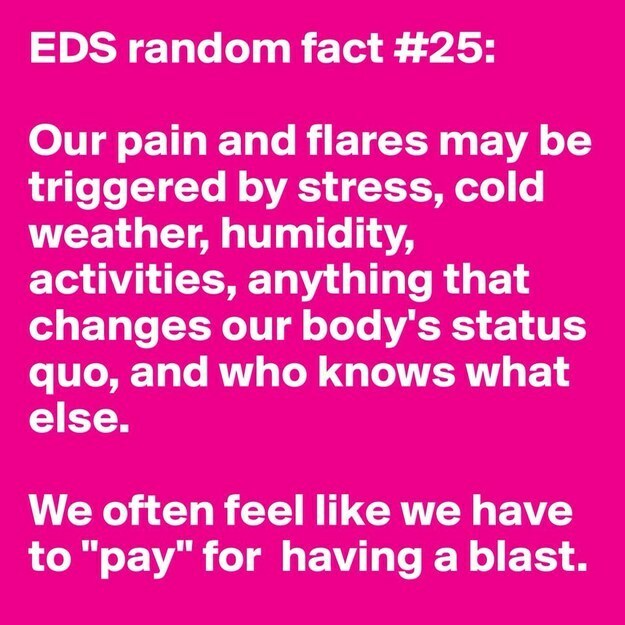 Having EDS/OI means that my joints are very loose and my bones are fragile and doing the simplest things like getting a jug of milk out for my cereal can dislocate a shoulder or a wrist or just standing up can dislocate a knee or break a bone. The good thing is that most of the time I can put my joints back in place and I have thus far broken very few bones. Most of the bones that I have broken are in my feet. I know it may not seem impossible but in a week, I have an average of at least 6 dislocations or subluxations which means an almost dislocation. If you have ever dislocated anything then you know how much pain I am in every day just from my joints not to mention my muscles and tendons and ligaments. I often have bone pain as well. There is not a part of my body that is not affected by these disorders. Our bodies are 80% collagen which is the glue that holds your body together. I don’t make enough collagen so everything that collagen holds together is compromised or can be compromised in my body from my skin all the way into my organs. This disorder has also affected my blood vessels and the way blood flows through my body, so I often get dizzy by just shifting in my chair or standing up. Most people who have EDS also have POTS Postural Orthostatic Tachycardia Syndrome which causes dizziness and sudden changes in heart rate and blood pressure. This leaves you very fatigued and many times unable to concentrate or stand up. 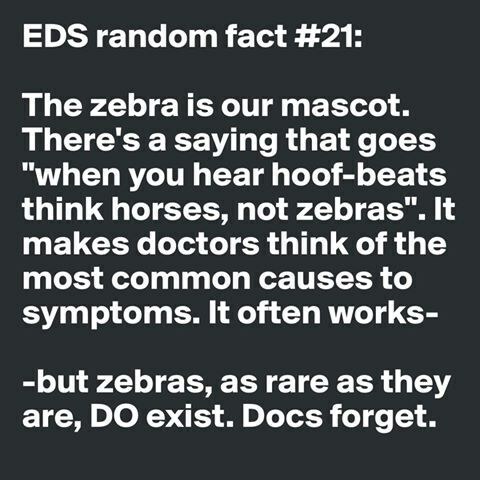 Having Ehlers Danlos Syndrome means that many things change all the time. 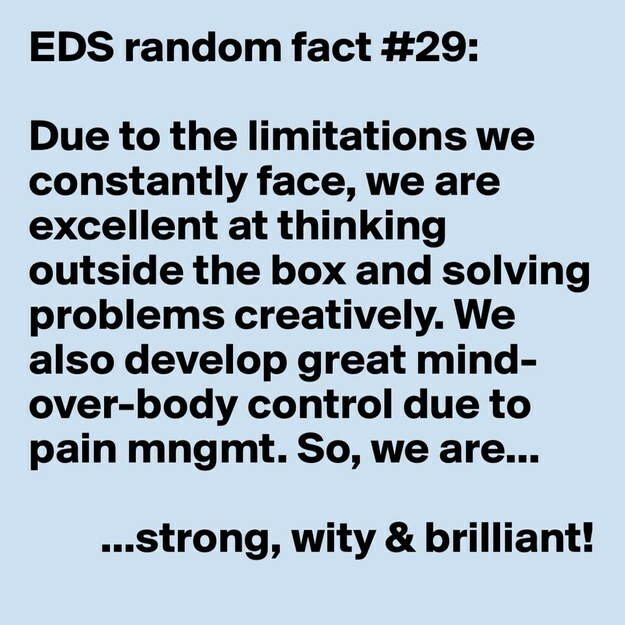 As a child, I had many injuries and several surgeries but since we didn’t know about EDS/OI or POTS we all thought that is just the way things are. As a kid I didn’t know that having pain all the time was not normal, I thought that was how everyone was, so I just kept going on with normal activities. As I have gotten older my body is no longer just able to go on with normal activities. On some days washing dishes for 5 minutes causes me to have to rest or recover for several hours and sometimes for days. So, you can see that is what I mean when I say things change all the time. One day I may be able to do lots of things and the next day I may not be able to get off the couch. I want you to know that just because the outside of my body doesn’t look like things have changed, doesn't mean they aren't real. ... These are the things that I would like you to understand about me…. I am scared. I don't know what the future holds for me. I already use a wheelchair at times, will I end up in one full time or will I be one of the lucky ones. If you find me being quiet and reflective, please don't think I am upset with you. I am trying to sort out my fears. I am angry. EDS/OI has taken so much away from me. I can no longer do many of things I enjoy doing. I sometimes have difficulty just completing simple tasks. If I appear angry please understand it is EDS/OI I am angry with, not you. Please understand that having EDS/OI doesn't mean I'm not still a human being. I have to spend most of my day being very careful about what I do, and if you are around me I might not seem like much fun to be with, but I'm still me stuck inside this body. I still worry about everyday things and most of the time I'd still like to hear you talk about your worries too. Please understand that there are parts of my body that are very sensitive to heat and cold and smells and loud sounds. If I excuse myself in certain situations that may involve those things please don’t think I am leaving you, I am not, I am just taking care of myself. Please know that EDS/OI can affect my thinking and my short-term memory so I may not be able to remember things that you tell me or things that I tell you. So, if I repeat myself, or if I seem like I am not paying attention to what you tell me it is not that, it is just that I have a hard time remembering sometimes. Please don't tell me you know how I feel. You don't. Don't offer me sympathy; I don't want your pity. But do offer me support and understanding, which I appreciate. I know sometimes I look perfectly healthy, but looks can be deceiving, it is very possible that I dislocated my shoulder just this morning reaching for a glass in the cabinet or a rib is out of place because I laid down in bed. Please understand that I am dealing with invisible pain and a lot of fatigue. Even on a good day, I feel like you do when you have the flu on your worse day of the flu (tired, achy and sore). Please keep that in mind. Please don’t be offended if you share with me that you are in pain or you are sick, and I don’t respond right away or at all. It is not that I don’t care, I care a great deal and I certainly know what it is like to be in pain and be sick. It is just that sometimes I just don’t have the ability to help out like I would like to. Please understand that if I am not very talkative that I am not ignoring you and it is not that I don’t want to be around you, but I hardly ever get a full nights sleep because my pain keeps me awake so I am probably just sleepy. Please understand the difference between "happy" and "healthy". When you've got the flu you probably feel miserable with it, but I've been sick for years (EDS and OI is genetic, this means I have had it since birth (even if I was only diagnosed in the last few years, I have been suffering from this since I was born)). I can't be miserable all the time, in fact, I work very hard at not being miserable and I work very hard not to show my pain. So, if you're talking to me and I sound happy, it means I'm happy. That's all. I may be tired. I may be in pain. I may be sicker than ever. Please, don't say, "Oh, you're sounding better!" I am not sounding better, I am sounding happy. Please understand that I can’t just get over this or just rest more to feel better. Even asleep I have pain. There is NO cure for EDS or OI or POTS (and until they find the exact genes causing it and technology and medicine get to a point where something can be done about this, there will be no cure), only some of my symptoms and pain can be treated. If there was something that helped, then I would be doing that! Please know that trying to get help for my pain and the other problems that my disorders cause is very difficult because many doctors don’t know much if anything about any EDS and some of the other conditions I have. Thank goodness for the ones that do, but they are hard to find. That is why I have gone undiagnosed until now. You cannot even imagine what all I have been told they “think” is wrong with me or how often I was just handed pain medication to move me along or even just dismissed because I’m too much of a challenge. If I seem frustrated, I am but I am not frustrated with you. I want you to know that the pain and instability etc from EDS/OI and yes even POTS move around. If I was able to do something one day I may not be able to do it again the next day. If you want me to do something, ask if I can and I'll tell you. Just because I climbed the stairs yesterday (or an hour ago) doesn't mean I can do it today (or in another hour). Yesterday (or earlier) my shoulder was throbbing; today (now) it is my knee, who knows what it will be tomorrow (or later). Also, understand that being able to stand up for five minutes, doesn't necessarily mean that I can stand up for ten minutes, or an hour. It's quite likely that doing those five minutes has exhausted my resources and I'll need to recover - imagine an athlete after a race. They couldn't repeat that feat right away either. Please repeat the above paragraph substituting, "sitting up", "walking", "thinking", "being sociable" and so on ... it applies to EVERYTHING that I do. 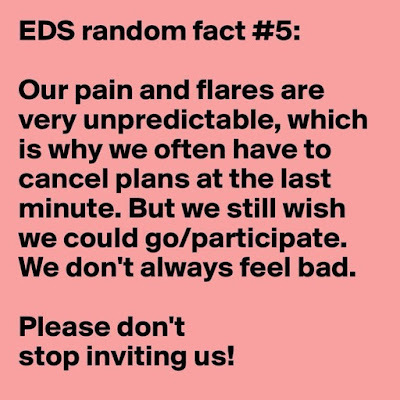 Similarly, EDS/OI and POTS and the symptoms of it may vary suddenly, meaning I may need to cancel an invitation at the last minute. 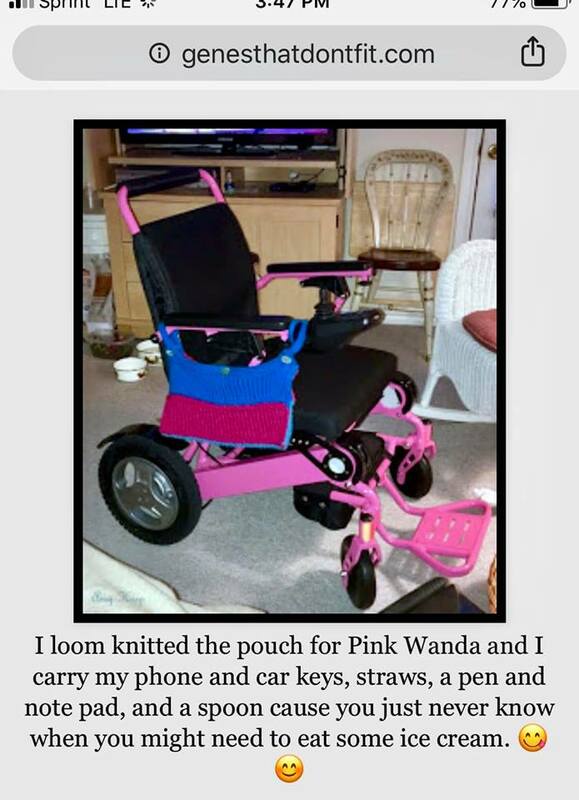 I am not able to help do things that involve lifting or bending or cleaning or walking. If you ask me to help out in those ways, please know I may have to turn you down and if this happens please do not take it personally and know if I am turning you down I for sure need help with those things myself. 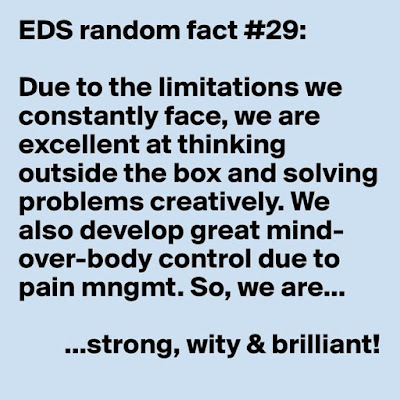 Please understand that EDS/OI and POTS does cause me depression every day of my life, wouldn't you get depressed occasionally if you had a body that could change suddenly for no reason, caused you pain 24/7 and could spontaneously rearrange itself through no fault of your own. If I seem down I probably am. Please know that I am not feeling sorry for myself. Just saying you understand will help. Please understand that if I say I have to sit down/lie down/take these pills now, that I do have to do it right now - it can't be put off or forgotten just because I'm doing something else more exciting. EDS/OI and POTS does not forgive its victims easily. Please understand that I can't spend all of my energy trying to get well from EDS/OI and POTS; it is incurable (and genetic which causes POTS, so unless I can change my gene’s I cannot change my disease/disorder). With a short-term illness like the flu, you can afford to put life on hold for a week or two while you get well. But an important part of having a chronic illness or disabilities like I have is coming to the realization that you have to spend energy on having a life while you're sick/disabled. This doesn't mean I'm not trying to get better. It doesn't mean I've given up. It's just how life is when you're dealing with EDS/OI and POTS or any chronic illness/disability. Please understand that I truly have pain somewhere in my body every single minute of the day. Please don’t laugh at me or make fun of me or my disorder. Please don’t tell me I hurt because I’m getting old and to wait until I’m such and such age. My body on the inside is like 90 years old already. I am doing my best. Please know that there are good days and bad days, more bad days lately than good ones, and that I am learning to pace myself and take better care of myself. I can’t always take care of the basic needs of everyday life and sometimes I don’t even have the energy to heat a can of soup, so I am left with lots of frustration and disappointments. I am learning to not be disappointed with myself but since these are a new diagnosis for me I am learning that me “not being able” is not because I am lazy or that I don’t try or that I didn’t take good enough care of me, turns out it is not my fault, it is just the way I was born. Finally, please remember that I am the same person I was before I was diagnosed with these; EDS/OI and POTS doesn't change the heart and soul, well it does change the physical heart but not my God-given heart. I still laugh, I still cry, I still love, and I still want to be a productive person. I am me, I am not my disease. Please continue to love me just as you did before. I need lots of love, support, and prayer just like you. But most importantly, I need you to understand me and ask me what I need instead of just assuming or guessing or doing what you think would be best for me. My needs are simple at times but at other times they are as rare as my disorders. Please be patient with me and know that I would much rather talk about you and your life and what you’re doing than anything that is happening to me but there are times that I need to talk about the stress that my illness’ is causing me just like you need to talk about your life stressors. If you find my illness’ too hard to understand or you don’t know how to help me or talk to me, know that I will feel that and feel very abandoned by you. Think about if you were in my place what you would want and then ask me if that would help or not. I need you in my life and I do have something to offer to you as well. Most people with EDS are very determined and strong-willed. I don’t give us easy and I will overdo either out of determination or because I forget that I will pay for my actions later and sometimes I need to be reminded that I don’t need to do things but that I need to relax and ask for help and receive that help when it’s offered. The last thing that people with EDS want is to be a burden on anyone and as a chronically ill person it is very easy to sense when others see you as a burden so for myself, I tend to stay home because I’ve been forgotten and made fun of or asked to stop talking about my illness so many times that the energy that I expend to deal with the emotional pain from those types of actions is something that I cannot afford. I need gentle hugs and love from you and most of all acceptance from you without me having to hide who or how I am. In March of 2018, I was diagnosed with Osteogenesis Imperfecta. This is a brittle bone disease. In childhood, I was blessed to have only broken a few bones. In my left wrist I broke several bones when I was a teenager and then when I was a freshman in high school I broke my collar bone in a car accident. As an adult, I hate to say, as I am now middle-aged, I have at least 6 breaks in my right foot and a break in my left tibia of which I didn’t even know was broken until my doctor found a healed fracture on an x-ray. The same happened with 2 of the 6 fractures in my foot. That’s some strong pain tolerance to be able to walk on a broken leg, and 2 broken bones in your foot, the bones in my foot were broken at the same time. I can remember the day that I broke them, now that I know they were broken, because I stepped on my foot, I was just walking, but I remember feeling a very horrible pain that lasted a day or two. There was another time that I was standing by a chair to sit down and I slide my shoe off and when I placed, not even stepped, but just placed my foot on the ground, I broke a bone in my foot. I knew that I had broken that one because by that point I was beginning to recognize what broken bones feel like. It is a different feeling than dislocating a bone. Why I say this is because I dislocation a joint at least once a day if not more, so I already have a high pain tolerance. I’m learning that I no longer need to try and walk off the pain or just try to work it out because now that I know that I have OI, I need to pay more attention to the fact that if I have pain, especially in my feet or hands, I most likely have broken a bone. The type of OI that I have affects your hands/wrists and feet more than anything once you reach middle age. And that’s right where I am. Vanity may play a small part in being sad about being middle-aged but more so just knowing how fast life is going by and know how much of it that I miss because of the rare genetic disorders that I have that causes me to have to live my life in a manner that most people never have to consider. About my disorders, well, really they are called Syndromes because they involve many different issues whereas a disorder can be more focused on just a few or one issue, at least that’s how I understand it. 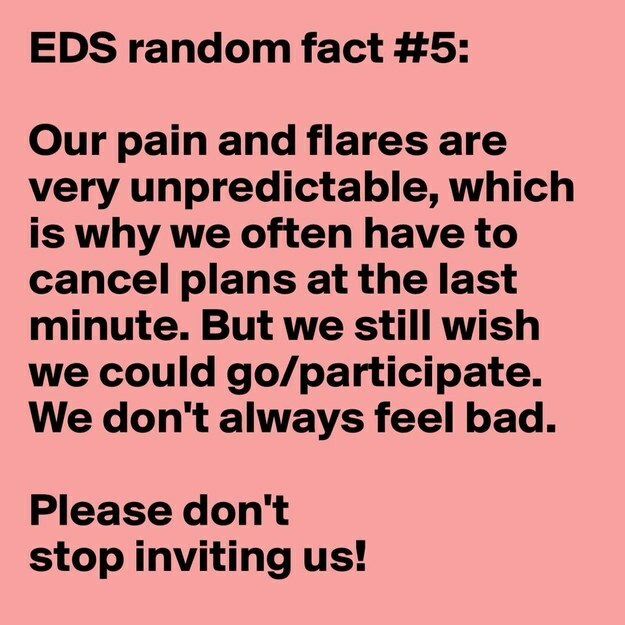 So, one of the syndromes that I have, and I have lots of them, is called Ehlers Danlos Syndrome which causes you to have many many symptoms and issues, but the main one for me is dislocation of joints. These Syndromes that I have are genetic disorder which means that I was born with them and because as of now Science has not found a cure then I will deal with these for the rest of my life and the two that I’m going to tell you about today are progressive which means that right now, it’s as good as it’s going to be for me and trust me it’s not good now. I used to notice that about once a year to every 8 months that I would have some type of problem that my body would not be able to recover from like it used to and then it became about every 6 months this would happen and now it’s sometimes as much as once a month that I will get sick or have an issued or an injury happen and I am not recovering from them. This is proof just how progressive these can be. 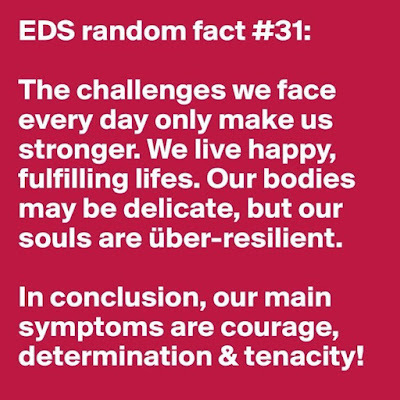 What scares me about this is that although I could certainly die from complications of the major heart issues that I have that is part of the EDS and OI, or a ruptured organ, or artery, these syndromes do not kill you. I guess that is good news, but it’s also bad news for me because the people in my family tend to live well into their 90’s and I am on 51. I do know in my family my birth father had EDS, who I have inherited these from. He died at an earlier age due to complications of a car accident. I’m adopted but I have met my birth families and I also have a half-sister from my birth father who has EDS along with her children. So on to the syndromes that I have. One is called Ehlers Danlos Syndrome Classical Type 1 or sometimes just known as Classical Type. The type I have effects about 1 in 20,000 to 50,000 people although there are many others out there like I was who have gone undiagnosed. I have another rare genetic disorder called Osteogenesis Imperfecta Type 1. To have the combination of EDS and OI is very rare. I was told by my doctor that less than 50 people in the world have this. I'm sure that with research and better ways of testing that more people would be found to have this same combination. Another syndrome I have is called Platypnea-Orthodeoxia Syndrome. This is caused, for me, because of a hole that I have in my heart that I was born with. The hole opens and closes depending on the position my body is in. I have been told by my heart doctor that less than 30 people in the world have this disorder. I would call that pretty rate. The symptoms occur when the patient is upright, sitting up or standing, and go away quickly when the patient lays down. I will share more about this syndrome in another post. I will explain all of these in another blog post. I have shared lots of information about EDS before, so I want to focus this post on OI and what it is. Osteogenesis imperfecta (OI) or Brittle Bone Disease is a complicated, variable and rare disorder. Its major feature is a fragile skeleton, but many other body systems are also affected. OI is caused by a mutation (change) in a gene that affects bone formation, bone strength and the structure of other tissues. It is a life-long disorder. OI occurs equally among males and females and in all racial groups. It is estimated that approximately 25,000 to 50,000 people in the U.S. have OI. (Having OI and EDS Classical type together is extremely rare, it is said that there are less than 30 people in the world with this combination.) With good medical management and supportive care, the majority of people who have OI can expect an average life span. Type II OI is the most severe form. Infants are quite small and are usually born with multiple fractures, an unusually soft skull, and an unstable neck. Limbs may be disproportionately small and legs may fall into a frog-like position. The head may be large for the size of the body. Almost all infants with Type II OI die at or shortly after birth, often due to respiratory problems. In the newborn period, it can be difficult to distinguish between Type II and severe Type III OI. This means that some children diagnosed clinically as Type II at birth may actually have Type III OI and have a longer life expectancy. People with Type III OI are born with fractures. X-rays may reveal healed fractures that occurred before birth. Common signs include short stature, progressive long bone deformities, spinal curvature, and a barrel-shaped rib cage. People with Type III OI may have anywhere from several dozens to several hundred fractures in a lifetime. Surgical correction of long bone bowing and scoliosis is common. Life expectancy varies. Some people with Type III OI have severe, sometimes fatal, respiratory problems in infancy or childhood. Some children and adults with severe Type III OI may require supplemental oxygen. Some individuals succumb to respiratory problems in adulthood due to progressive rib cage and spine deformities. Other people with Type III OI will have a near-average life span. Children inherit two copies of each gene – one from each parent. When OI is caused by a dominant mutation only one copy of the OI gene mutation is necessary for the child to have OI. In the majority of cases, the gene is either inherited from a parent who has OI or results from a spontaneous new mutation occurring at the time of conception. In rare cases, dominant OI can occur when a parent is mosaic for an OI mutation. This means that an OI causing mutation is present in a percentage of one parent’s cells, but does not cause any symptoms in the parent. For a child to inherit OI in a recessive manner, the gene mutation must come from both parents. In this situation, the parents do not have OI, but both carry the mutation in their genes. There is no cure for OI, but there are ways to manage the symptoms. Despite the obstacles, many people who have OI lead productive and fulfilling lives well into their adult years. The goal of all treatment is to minimize fractures, enhance independent function, and promote general health. Medical care for children and adults who have OI involves an interdisciplinary team. This can include a primary care doctor, orthopedists, endocrinologists, geneticists, rehabilitation specialists, neurologists, and pulmonologists. Treatment may include fracture care, physical therapy, surgical procedures, medications, lifestyle features, and mobility aids. Physical Therapy and Safe Exercise. Goals for physical therapy include expanding and maintaining function and promoting independence. A typical program includes muscle strengthening and aerobic conditioning. Physical therapy often begins in infancy to counteract the delay in motor skill development many children experience due to OI related muscle weakness. Adaptive devices may be needed. Occupational therapy can help with fine motor skills and selection of adaptive equipment for daily living. As a child with OI grows older and gains more independence, he or she will benefit from continued physical activity, such as adapted physical education. Adults with OI also benefit from safe, regular exercise to maintain bone and muscle mass. Swimming and water therapy are particularly well-suited for people with OI of all ages, as they allow independent movement with little fracture risk. Walking is also an excellent exercise for those who are able (with or without mobility aids). Medications. Bisphosphonate drugs, which are currently approved by the Food and Drug Administration (FDA) to prevent and treat osteoporosis are used off label to increase bone density in children and adults with moderate and severe OI. Other drugs that were developed to treat osteoporosis are also used to prevent age-related bone loss in adults who have OI. Teriparatide (a drug based on the parathyroid hormone) is one of them. Treatments under study include growth hormone and gene therapies. The search continues for a drug treatment that is specific for OI. Maintaining a healthy weight is important since extra weight adds stress to the skeleton, heart, and lungs and reduces the ability to move easily. In addition, people with OI should avoid smoking, second-hand smoke, excessive alcohol or caffeine consumption, and steroid medications, all of which reduce bone density. Are There Precautions to Take When Caring for People with OI? Never pull or push on a limb, or bend it into an awkward position not even to take an x-ray. Always dose medicines to the size, NOT the age of short-statured adults. Lift a baby with OI by placing one hand under the buttocks and legs, and the other hand under the shoulders, neck, and head. There is evidence that OI has affected people since ancient times. It has been recognized in an Egyptian mummy of an infant from about 1000 BC. The mummy is currently in the British Museum in London, England. A Viking leader who lived in the 9th century, Ivar Ragnarsson “Ivar the Boneless,” probably had OI. He is reported to have been a very wise leader and a very fierce warrior who had to be carried into battle on a shield because his legs were so soft. Case studies of people with fragile bones and hearing loss began appearing in medical literature in the 1600s. The term “osteogenesis imperfecta” was used in medical literature beginning in the 1840s. Early in the 20th century, OI was identified as a condition people were born with rather than an illness they acquired later. Today, people who have OI are involved in every walk of life. I’ve said this before and I’ll say it again….. It is good to know what is wrong with me as Ehlers Danlos Syndrome and Osteogenesis Imperfecta OI explains everything that has ever been wrong with me from literally the top of my head to the bottom of my feet since birth. I am however dealing with the reality that my pain and fatigue along with many other things that I deal with will be with me for the rest of my life. My pain greets me in the morning, stays with me in every step I take and every movement that I make, it puts me to bed at night, or earlier, and it haunts my dreams and wakes me from my dreams nightly. This as for now will be the rest of my life. The Frown Fixer series of the Carly Joke Remembering Collection. 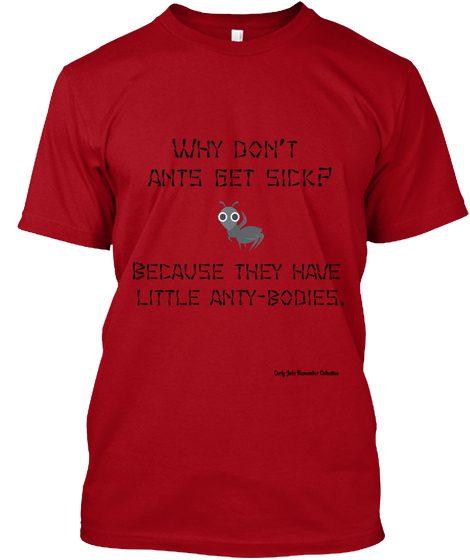 I have a friend Carly who can never remember jokes so I decided to start selling t-shirts with a joke on it so people like Carly don’t have to worry with remembering jokes because now they can become a Frown Fixer with me by wearing their joke for the whole day. These are my first products in my Carly Joke Remembering Collection. 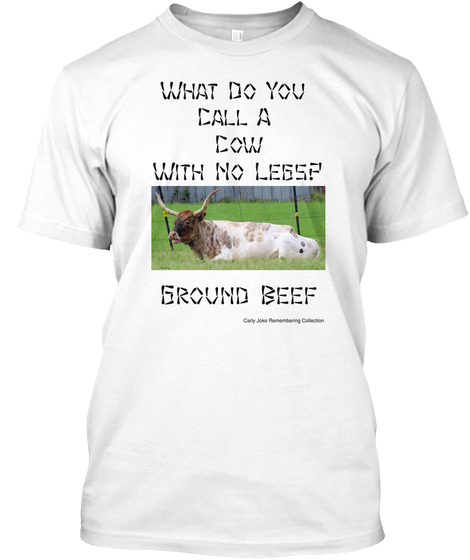 Go get yourself a shirt you forgetful people, no really before you forget.... hurry up!!! Here’s a quick look inside the book. 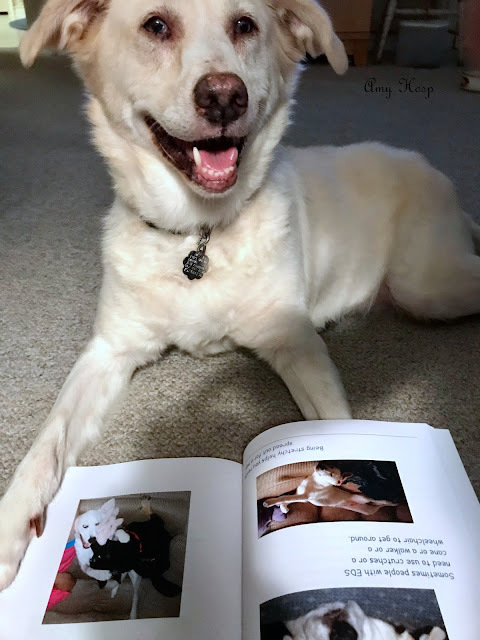 New updated copies of Liberty the Dog’s book are in. She’s so excited and she made me sit down and listen to her read it to me. You can find a copy of her book anywhere books are sold online. 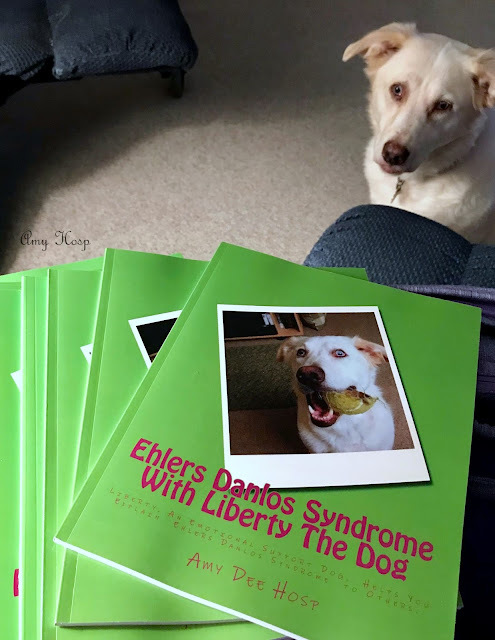 Ehlers Danlos Syndrome with Liberty the Dog. This book can be found anywhere that books are sold online. Click on this link or copy and paste it into your address bar!! 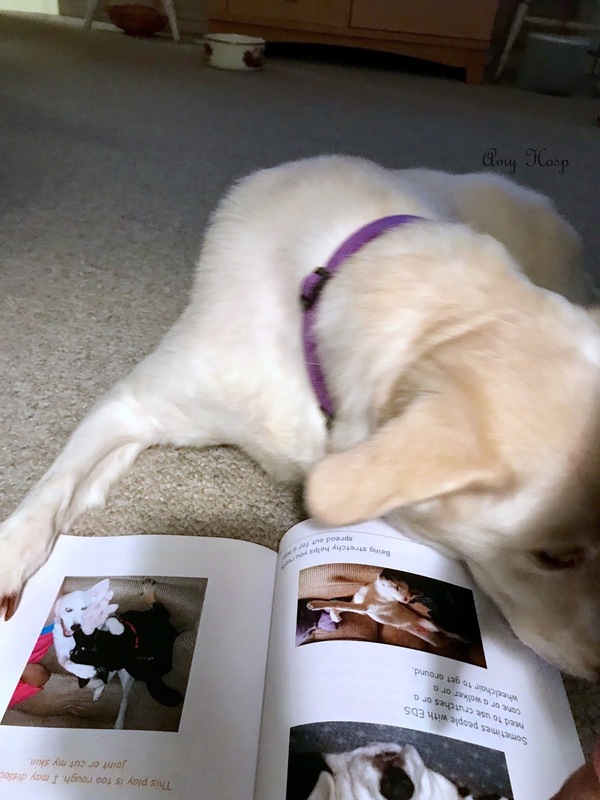 Liberty, an Emotional Support Dog, Helps You Explain Ehlers Danlos Syndrome to Others. 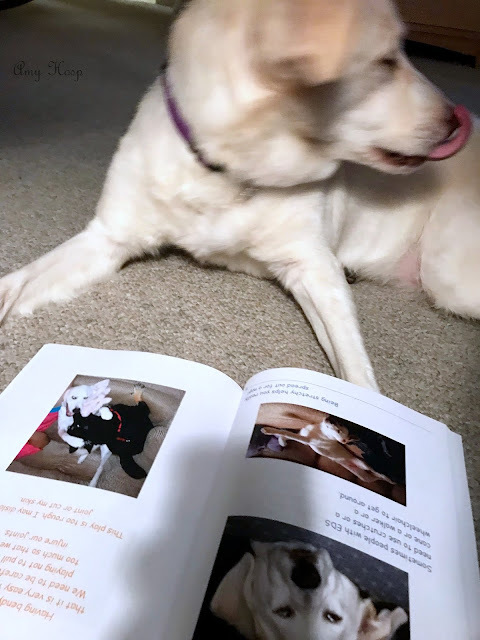 Liberty, the Ehlers Danlos Dog, shares a genetic disorder with her owner called Ehlers Danlos Syndrome. 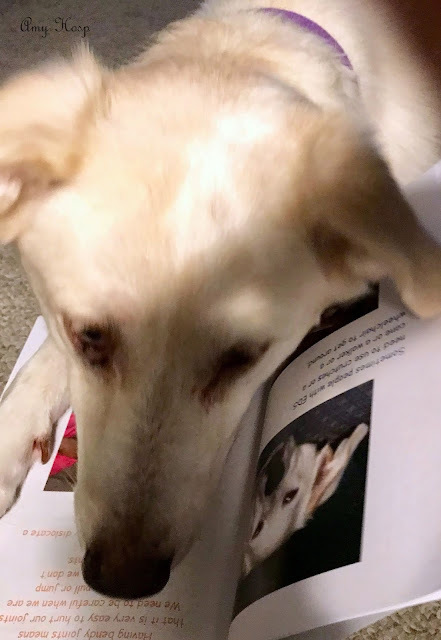 This is Liberty's story about what it is like to live with EDS and how she, an Emotional Support Dog, helps her owner. 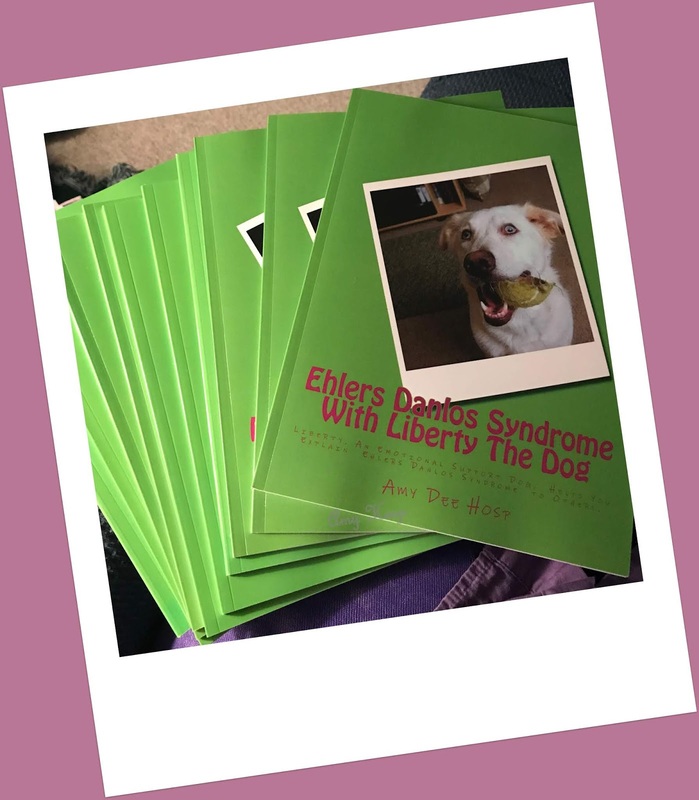 Liberty's story will help children who have Ehlers Danlos Syndrome not only understand better what EDS is but how to explain it to friends and family along with helping to educate others about the EDS child's special needs when at play or participating in sports. This book is a great tool to help your child at the beginning of the school year introduce themselves with some of their challenges to their classmates and teachers. Amy Hosp grew up in Frisco TX and she is a graduate of Dallas Christian College where she earned a B.S. in Ministry & Leadership and has spent some time working toward earning a Master's degree at Southwestern Baptist Theological Seminary in Ft. Worth TX. In 2005 Amy served as a missionary in Nigeria. In 2012 Amy was diagnosed with a rare genetic disorder called Ehlers Danlos Syndrome. She has Classical Type I which causes a host of health issues that have left her disabled. Despite her disabilities, Amy enjoys random adventures ranging from a spur of the moment road trip to the country to exploring ideas of the unknown in life. Her life is a voyage and she wants to invite you to go along with her and find in you, what she has and is still finding, "The person that God created me to be!" Amy is a writer, photographer, musician, and a missionary. She deals with life by always looking for the positive side to every situation and she will leave you with a smile. Her passion is to challenge the minds of others to look deep inside of themselves and look at life from a different perspective and also to find the true giftings of God in their lives. Amy brings a unique view to understanding God's fullness and happiness for today's believer.